Successfully Added Ken Xin Da W6 Rugged Smartphone - IP68 Waterproof, Dust Proof, Shock Proof, 4G, Android 6.0, Dual SIM (Yellow) to your Shopping Cart. The Ken Xin Da W6 is a real tough cookie. It has a toughened plastic and rubber case for durability and shock proofing. What is more each port is covered by a rubber grommet allowing the phone to achieve an IP68 rating against water and dust ingress so its triple protected aghinst all the hardships it may encounter. Indeed the phone was recently tested in mud, dirt, flour and then washed off by a good dunking in over 1 meter of water for well over 30 minutes and it never missed a beat or suffered any damage making it a real survivors' phone. Even the most carless users will be impressed by its durability. For its performance the phone relies on a quad core CPU and 1GB or RAM which the Android 6.0 OS allowing it to excels at multitasking, playing videos, surfing the web and a whole lot more. The Ken Xin Da W6 features dual SIM card slots and two IMEI numbers allow for dual standby so you can set up a personal and business number on the one device. What's more each of these can be active through the day without having to change settings so you can keep in touch with everyone in your life no matter where you roam. Supporting 4G means that each SIM slot has access to the fasted in mobile data connections and allows super fast download speeds capable of HD video streaming. great for Skype calls or catching up on your favorite TV shows, when you're out and about. The 4.5 inch touch screen hits a nice balance between viewing experience and portability this allows the phone to fit comfortably in one hand yet one diminish your viewing pleasure. 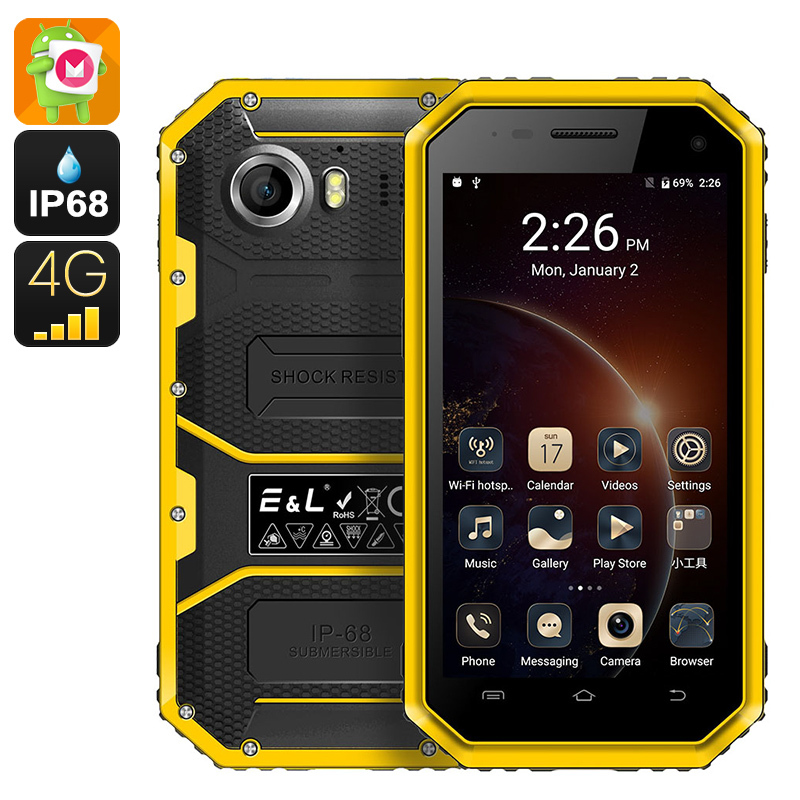 The Ken Xin Da W6 Rugged Smartphone comes with a 12 months warranty, brought to you by the leader in electronic devices as well as wholesale rugged phones..